The straight split alley sits perfectly between the squeeze chute and no-corner tub. 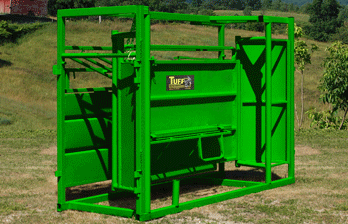 This unit is available in three different lengths to meet your specific cattle working needs. This is the same unit that is in our complete portable handling system. 8.5′ x 37″ 1100 lbs. 10.5′ x 37″ 1300 lbs. 17′ x 37″ 1900 lbs. 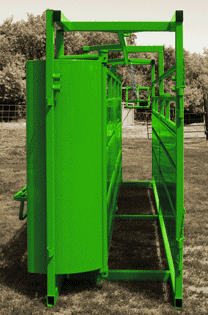 The adjustable width makes this piece versatile and easy to use regardless of what size your cattle are. 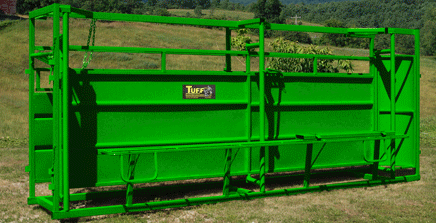 This unit can accommodate large bulls and tiny calves equally as well. 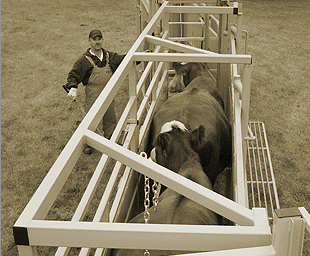 Some cattlemen prefer to add a splitting alley into their stationary set up to easily sort cattle as they work. This straight adjustable alley has hook-up spots located at both ends to easily attach to the next piece of equipment in your system. In addition, the hook-ups can also attach to our cattle panels so you can make a pen at the end of this unit. The no-corner tub is the perfect way to get your cattle into this alleyway. The Squeeze chute, the Adjustable Alley and the No Corner Tub can be d individually or as a complete portable handling unit. Contact us with your questions or to request a quote. We highly enjoy talking about our equipment and firmly believe we’re the best on the market. Our cattle equipment is designed with cattlemen in mind because our founders are cattlemen themselves.